Similar size to the Sandwich Tern, but distinguished by its short, strong, all-black bill, slightly broader bases to the wings, shorter neck, shorter, less forked tail and longer legs at rest, and also by its very different feeding behaviour. Does not normally dive but catches its prey gracefully like a marsh tern over water or vegetation. Adult breeding: uniformly pale grey on the upperparts, rump and tail. Primaries grey with dark trailing edge often well-defined from above, and with a clear border from below. Adult non-breeding: isolated dark mask behind the eye. Juvenile: bill finer than the adult’s, upperparts almost uniformly pale, pale crown, and faint mask behind the eye. Voice: distinctive high-pitched, rising call “ee-wik”. Alarm a rapid “vik-vik-vik”. L. 35-42 cm ; W. 76-86 cm. 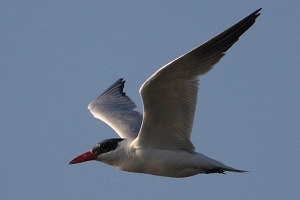 Distinctive, with its large size (the largest tern), and its very big red bill. Underside of the outer wing conspicuously dark in all plumages. Wingbeats slow and flight similar to a large gull. Adult: bill bright red with a small dark tip. Legs black. Crown dark with only the forecrown streaked white in winter. Juvenile: bill orange-red. Upperparts and tail with dark markings. Wing with no dark leading edge. Voice: loud, harsh, drawn-out “rrriiiahk”. L. 48-55 cm ; W. 96-111 cm. Size intermediate between the Sandwich Tern and the Caspian Tern. 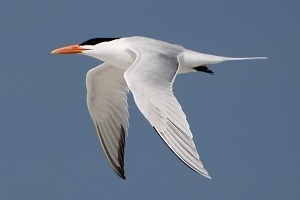 Differs from Caspian Tern in all plumages by its smaller size, thinner orange bill, narrower wings, longer more forked tail, and narrow black trailing edge to the underwing. Differs from the Lesser Crested Tern by its larger size, heavier bill, white rump and tail, and paler upperparts. Juveniles have a very contrasted pattern on the upperwing, and a paler bill. 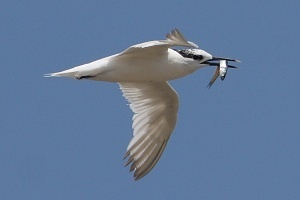 Voice: similar to Sandwich Tern, but deeper, rasping, and harsher: “kirrek” or “krri-it”. L. 42-49 cm ; W. 86-92 cm. 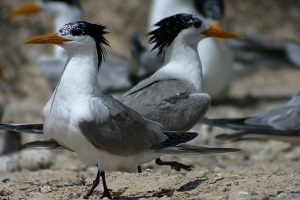 Similar species: Caspian Tern, Sandwich Tern, Lesser Crested Tern. Very similar in size to the Caspian Tern, with long wings. Distinguished from it in all plumages by its long, slightly downcurved yellow bill, and permanently white forehead. The upperparts are also darker. Adult: mantle, back, rump and upperwing fairly dark grey, contrasting with the white underbody. In flight, fairly uniform above with a marked dark trailing edge to the under primaries. Crest loose and spiky. Bill quite bright yellow in summer, more greenish in winter. Juvenile: bill yellow, shorter. Crown dark with heavy white markings. Upperparts and wings overall very dark, with a paler area in the wing formed by the broadly pale-edged median coverts. L. 50-54 cm ; W. 125-130 cm. Very slightly smaller than the Sandwich Tern. Differs in bill colour, which is pale orange in juveniles and immatures to bright orange in adults, with the tip often a little more yellow and usually slightly shorter and deeper at the base, and more slender with a very pointed tip. The wings are proportionally longer. The flight is lighter. The tail is more deeply forked. 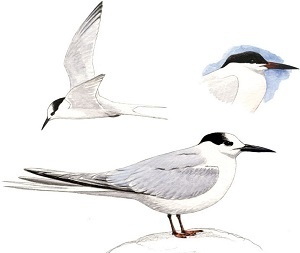 Adult breeding: compared with the Sandwich Tern, darker and more uniform grey above, including the rump and centre of the tail. Adult non-breeding: like the adult breeding, but with the forehead white and crown marked with white. Juvenile: like the non-breeding adult, but bill shorter, upperparts marked with brown to blackish-brown. 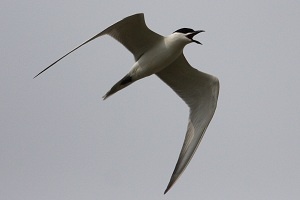 Voice: sharp “ki-riik” very similar to the Sandwich Tern’s call. L. 33-40 cm ; W. 76-82 cm. Similar in size to a Black-headed Gull but slimmer. Long slender bill. Short legs. Fishes with powerful wingbeats, the wings being then held bent at an angle and they are long and of uniform width along the whole length of the wing. Tail relatively short. Adult breeding: light grey above and white below. Elongated mark or wingtip diffusely dark above, forming a wedge-shaped mark on the wingtip. From below, indistinct darker border along the tips of the outer primaries. Legs black. Bill black with a yellow tip. Rump and tail white, contrasting with the grey back. Adult non-breeding: like the adult breeding, but the forehead and crown turn white from June onwards. Juvenile: bill short with no pale tip, dark. Crown dark. Upperparts barred. L. 37-43 cm ; W. 85-97 cm. Similar species: Gull-billed Tern, Lesser Crested Tern. 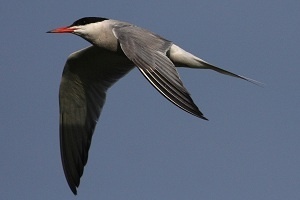 Wings shorter, wingbeats faster and shallower than in the Common Tern and Arctic Tern. Long tail. Hovers less and dives characteristically at an angle. Adult breeding: upperparts very pale grey, and underparts whitish flushed with pink. Bill all black or with a red base. Legs quite long, bright red. In flight, narrow elongated dark mark on the wingtip contrasting with the otherwise very pale upperparts. No dark trailing edge below. At rest, inner primaries pale with the inner edge white. Adult non-breeding: bill black. Forehead and underparts white. Dark carpal bar. Tail streamers shorter. Juvenile: bill all black and legs dark. Forehead usually dark. Well-defined dark markings on the upperparts, which contrast very noticeably with the paler wing in flight. Voice: distinctive hoarse, low “krri-rikk”. L. 33-36 cm ; W. 67-76 cm. Similar species: Common Tern, Arctic Tern, White-cheeked Tern. Medium-sized tern. Legs red. Very similar to the Arctic Tern, but with the bill and head a little longer. The bill often appears downcurved. Legs longer. Also differs in flight by the longer head and neck, and the slightly broader wings arising from nearer the middle of the body. Hovers and dives suddenly to capture its prey. Adult breeding: bill orange-red, usually with a black tip. Upperparts pale grey. At rest, tail streamers do not extend beyond the wingtips. Dark pointed mark (formed by 4 to 6 primaries) on the outer wing, faint in spring and clearer in summer. From below, broad diffuse dark edge to the outer primaries. Adult non-breeding: bill black. Forehead white. Dark inner forewing. Juvenile: bill shorter with an orange base. Gingery brown above. In flight, leading edge of the wing dark, secondaries dark, and trailing edge diffusely dark. Rump grey. Voice: short “kitt”, rapid “ket-ket-ket”, distinctive “kyerri-kyerri-kyerri”, drawn-out disyllabic “kriiyaaa”. L. 34-37 cm ; W. 70-80 cm. 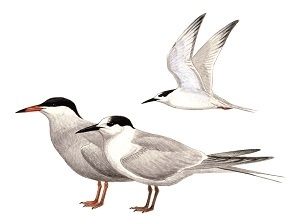 Similar species: Arctic Tern, Roseate Tern, White-cheeked Tern. 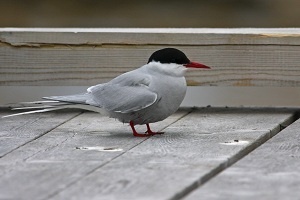 Very much like the Common Tern, but differs in its slightly smaller size and its shorter head, neck and bill, while the longer tail enhances the impression that the wings arise from further forward on the body. Wings narrower. Legs very short. Flight more elastic than the Common Tern. Often dives after several short bursts of hovering. Adult breeding: bill blood-red with no black tip. Rump, upperparts, chest, and belly grey, contrasting slightly with the white cheeks and upper throat. At rest, the long tail streamers extend beyond the wingtips. In flight, the whole of the remiges are white and translucent from below, and the primaries have a sharp narrow black edge. Adult non-breeding: moult does not usually start until the birds have reached their winter quarters. Bill short and black. Forehead white. In flight, dark leading edge to the wing and white secondaries. Juvenile: bill blackish with a reddish base, quickly becoming all black. Upperparts greyer with gingery fringes. In flight, leading edge of the wing diffusely dark. Distinct dark line along primary tips and white secondaries. Rump and tail white. 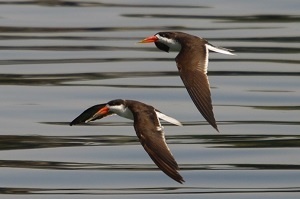 Voice: high-pitched “ki-ki-ki-ki”, “riiii-kriiii” with a different tone from the Common Tern, harsher. L. 33-39 cm ; W. 66-77 cm. Similar species: Common Tern, White-cheeked Tern, Roseate Tern. Similar to the Common Tern, but slightly smaller, with a shorter tail and a proportionally longer and thinner-looking bill. The wings are narrow, and the flight supple and elegant. The tail is shorter. Catches prey in flight on the surface or near the surface of the water. Adult breeding: bill dark with the base reddish at close range. Compared with the Common Tern, upperparts darker grey, underparts also darker grey and contrasting strongly with the white cheek. From below, broad trailing edge along the whole wing contrasting with the rest, which is whiter. Rump dark. Adult non-breeding: forehead and underparts white. Upperparts paler than in summer, and with a diffuse dark leading edge to the wing. Bill black. Juvenile: bill black with a reddish base. Legs duller. Upperparts marked with dark, scapulars and tertials, with neat blackish crescents. Tail and rump fairly dark grey. Upperwing a little darker and more uniform than in the Common Tern. Voice: similar to that of the Common Tern. L. 32-34 cm ; W. 58-63 cm. Similar species: Common Tern, Arctic Tern, Roseate Tern, Whiskered Tern. A little larger than a Common Tern, but distinguished by its dark upperparts (including the rump and tail) and the very deeply forked tail. Flight light and graceful. Adult: dark crown, nape and loral line contrasting with the paler grey upperparts. Forehead white, extending back as a broad supercilium to slightly behind the eye. Bill and legs dark. In flight, the upperwing is darker than the back. From below, broad fairly diffuse grey band along the trailing edge of the wing. Sides of the tail white. Juvenile: similar to the adult, but with less contrast on the head. Upperparts and wing coverts can be either marked with a scaly pattern or uniformly dark. L. 37-42 cm ; W. 65-72 cm. Similar species: Any in the area. Markedly smaller than the other terns. Wings long and narrow. Wingbeats fast. Hovers low over the surface. Adult breeding: forehead white. Black loral line. Bill yellow with a black tip. Legs orange-yellow. The outermost 2 or 3 primaries are blackish grey. Adult non-breeding: like the breeding adult, but bill black, lores white, and forecrown paler from August onwards. Juvenile: upperparts barred. Dark bar on the forewing. Bill blackish, pale yellow at the base. Voice: loud, sharp “kr’rit” calls. L. 21-25 cm ; W. 41-47 cm. 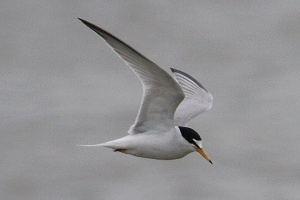 Larger than the other marsh terns, with longer legs, and a slightly stronger bill. 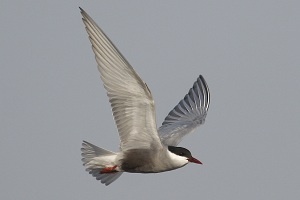 Compared with Common Tern, Arctic Tern, and White-cheeked Tern, flight different, tail noticeably less forked. Rump and tail greyish, different from the first two species. Adult breeding: chest and belly medium-grey, contrasting with the mainly white cheeks and underwing. From above in flight, remiges pale grey. Bill and legs red. Adult non-breeding: rear crown finely streaked with black and a black spot behind the eye. Upperparts very pale grey. Juvenile: crown dark. Mantle and back heavily marked with dark and gingery-brown. Rump whitish. Wings pale, usually with no dark leading edge. Voice: harsh call “krreh” or “chrake”. L. 24-28 cm ; W. 57-63 cm. 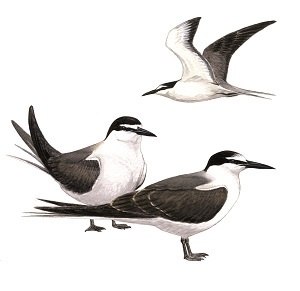 Similar species: Black Tern, White-winged Black Tern, Common Tern, Arctic Tern, White-cheeked Tern. Adult breeding: head black. Underparts blackish. Upperparts uniformly dark grey. Bill and legs dark. In flight, the underparts contrast with the distinctly pale underwing. Rump grey. Adult non-breeding: very similar to the juvenile but the grey upperparts do not show scaly markings. 5 to 7 outer primaries darker than the others. Crown and ear-coverts black. Rump grey. Dark pectoral patch on each side of the neck. Legs more reddish. Juvenile: crown extensively dark, and clear dark pectoral patches. Dark “saddle” on the back. Scaly patterning with pale tips on the back and tertials. Voice: nasal “ki-rehhh” or klitt”. L. 22-26 cm ; W. 56-62 cm. 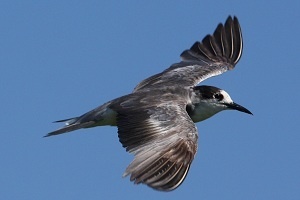 Slightly smaller than the Black Tern, with a shorter bill, longer legs, broader wings, and a shallower tail-fork. Legs red in all plumages. Adult breeding: head and underparts black. Back grey-black. All contrasting at rest with the white wing-coverts. In flight, white rump and leading edge of upper wing, contrasting with the dark head and back. From below, underparts mainly black and wing coverts black, contrasting with the white tail and grey remiges. 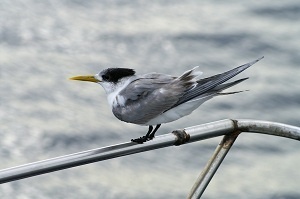 Adult non-breeding: compared with the Black Tern, distinctly more whitish, with the crown streaked with dark, and a dark mark behind the eye. Rump and sides of tail whitish. 1 to 4 primaries darker than the others, contrasting with the rest of the wing, which is mostly pale grey. Juvenile: like the juvenile Black Tern, but no pectoral patch on the sides of the neck, back blackish-brown contrasting strongly with the pale inner wing and the white rump. Voice: “kre-ekk”, harsher and deeper than the Black Tern. L. 20-24 cm ; W. 50-56 cm. Unmistakeable. 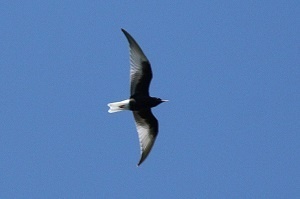 Resembles a large tern with long, pointed wings. Unique bill, with the mandibles interlocked like scissors, and the lower mandible longer than the upper. Distinctive fishing action, with strong, flexible flight very low over the surface, and the lower mandible sliding through the water. Adult: bill red with a yellowish tip. Legs red. Forehead, cheeks, throat, neck, and underparts white. Upperparts, wings, and tail slate-grey to black. The tail has white sides. The secondaries seen from above are edged with white. Seen from below, the wing is largely white with the primaries darker. Juvenile: bill dark with a red base. Legs orangeish. Crown and nape greyish. Upperparts, wing coverts, and remiges fairly dark grey with broad white edges. L. 38-40 cm ; W. 106-112 cm.